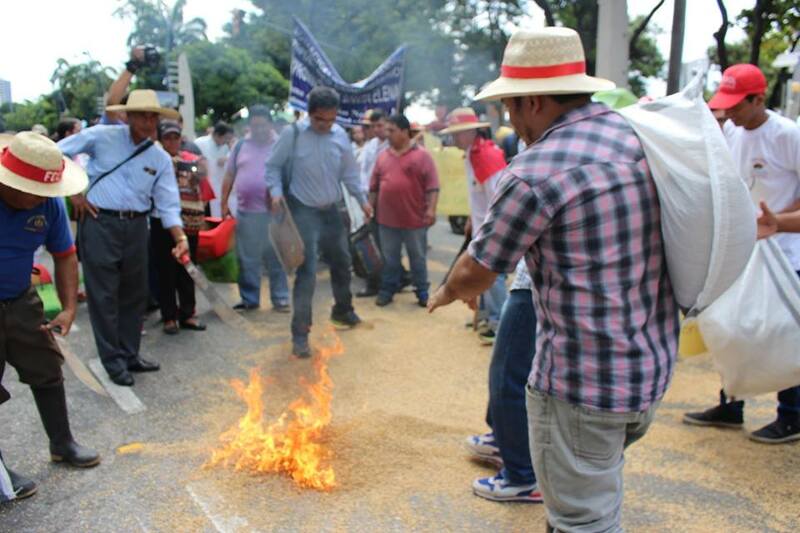 Burning soy seeds lit up the city streets of Guayaquil, Ecuador, last May as dozens of farmers, activists and indigenous people protested a controversial decision allowing research with genetically altered, or transgenic, plants. Since then, demonstrators have marched in different cities across the country including the capital, Quito. And scientists, both anti- and pro-GMO, are unhappy with the ruling as well. Now, the Federation of Peasant Organizations of the Littoral (FECAOL), the association organizing the protests, says it’s planning a nation-wide strike, possibly as soon as December 20. Nearly a decade earlier, in 2008, the government of former president Rafael Correa rewrote Ecuador’s constitution. The new document adopted article 401, which defines the country as a transgenic-free territory, after an intense lobbying by environmental and left-wing groups. But Correa, who thought the article was a restrictive measure and publicly announced his support for biotechnology in 2012 by calling it a “constitutional padlock,” was able to include that, under “cases of national interest,” the president can approve the introduction of transgenic crops — which have been genetically modified with one or more foreign genes from different species, like a virus, bacteria or another plant. On May 19, 2017, just five days before his term ended, Correa modified a so-called ‘seed law’ to authorize the experimental use of transgenic seeds and plants. Allowing genetic research on plants has also angered the Ecuadorian scientific community, who condemn the absence of guidelines specifying how to handle the technology. And experts from both sides of the GMO debate are voicing their objections. Some of them see the law as an outright threat to Ecuador’s ecosystems. Elizabeth Bravo, a biologist at the Salesian Polytechnic University in Cuenca, has become one of the leading critics. “Of course [transgenic plants] will affect biological diversity,” she says. She fears that some of the 29 local landraces of maize — a crop widely consumed in Ecuador — will accidentally incorporate transgenes into their genomes, particularly if transgenic varieties are introduced on a large scale. Intriago agrees, noting that a number of plants, like the Andean potato, originated and were domesticated in the country. The introduction of transgenic seeds could jeopardize the genetic diversity of those native species if they show an advantage over native genes, and could eventually replace wild strains used in agriculture. Some studies also suggest that it would be difficult to get rid of undesired transgenes once they have diffused into local landraces. This is why, without the proper regulatory framework, Ecuador is not ready to deal with this technology, Intriago says. Opponents of biotechnology are not the only ones displeased. Supporters of transgenic manipulation were disappointed by the new changes to the seed law, which, they claim are either ambiguous or simply incompatible with the constitution. Others criticize the vague language of the amendment. The seed law, they say, states that transgenics can only be used for research purposes. But it does not clarify whether scientists are able to genetically modify plants for research or test already existing patented crops. Eduardo Morillo, a biotechnologist at the National Institute of Agricultural Research in Quito, adds that it is even obscure on whether transgenic seeds can be studied in laboratories, greenhouses or plots of land.